If you’d told us that there would be a Real Housewives episode of This Is Rad, when we started This Is Rad, we’d have worried you’d come from the darkest timeline. And hey, maybe you did, we don’t know. 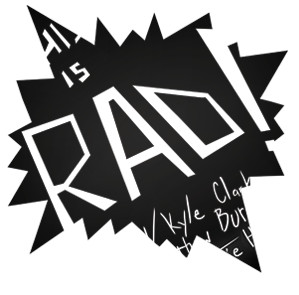 But this episode is, in fact, rad. That is thanks, in no small part, to our guest, the brilliant and hilarious Annie Lockwood. Annie is in LA visiting from the ATL and sat down with Kyle and Matt to talk about her love of the many flavors of Real Housewives. Annie was Kyle’s opener for his album taping back in December. They met may years ago at a mic in Atlanta and Kyle has been a fan ever since. Believe it or not, this episode has some insane tangents. Burnside turns the show into an episode of Shark Tank for a while. Tweet at us if you would buy Matt’s product. Lot of talk about butts in this one. Like… a lot. Enjoy! Kyle’s new record label RadLand Records is doing a launch party / album release party at The Barkley in Pasadena at 8pm on February 6th, 2019. It’s free and features comedy from Kyle, Solange Castro, Keith Carey, Tom Goss, Vance Sanders, and Maria Bamford! Plus, free RadLand Records stickers! Plus: Matt and Laura will also be there, so if you come hang out you can get a picture with the whole gang!